Simon continued to trek the path around Oquirrh Lake, being careful to stay out of the forest itself. While his home was in the forest and he was well aware of the creatures within, he found that it was sometimes easy to get turned around among the trees, and now was no time to get lost. Moving quickly, he became aware of something occasionally slapping up against the leg of his trousers. Glancing down, Simon noticed one of his shoe laces had come untied. Fortunately, he was near the old guard towers, and decided to lean against them for support while tying his shoe. He knew that, given how hard he had been traveling today, sitting down would likely mean not being able to get back up, so leaning against one of the old stone towers was his best chance of fixing his problem while continuing to move. Coming up to the abandoned towers, he leaned gently against the stone and very carefully sat the Book of Life and Death down on the grass next to him. He leaned forward to tie his shoe when he noticed something creeping around the edge of the tower next to him. Low to the ground, and moving very slowly but steadily, was what appeared to be a hand made entirely of sticks. Not wanting to cause a commotion, Simon slowly reached towards the Book and grabbed it, yanking it just in time from the grasp of the rustic looking hand. The hand instantly balled into a fist, and a short figure leaped out from around the corner of the tower. "Give me that, boy," the voice said, "don't belong to you!" The voice was attached to a short, strange creature that Simon struggled to recognize. 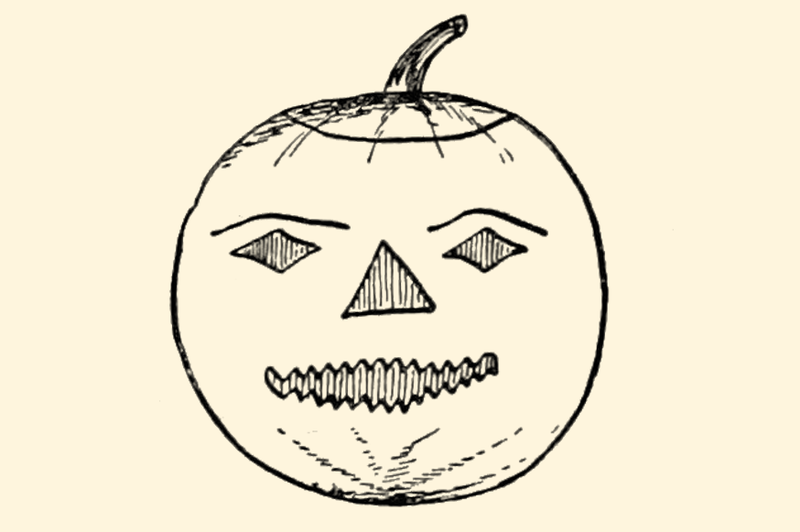 The creature's head was a carved jack o'lantern whose mouth moved as the creature spoke; the body was mostly hidden beneath a long, flowing cape, and all else that was visible were two arms and legs made out of old sticks and twine. The figure looked like some sort of crude puppet, but moved and spoke all on its own. "What are you," asked Simon, drawing the Book close to his chest and holding on tight. He could see the creature fidget and squirm the tighter that Simon held the Book. "Doesn't matter to you, just gimme gimme gimme," the creature said, thrusting a brown, narrow finger towards Simon's face. "Kid like you don't need no book like that." Simon frowned. "I'm not even discussing the book with you until I know who, or what, you are." The creature's smile grew big and wide, and seemed to almost take up the entire pumpkin. "Well ain't that just the way it goes," crooned the creature, shuffling back and forth in place. "I have many names and am called a great many things, but you might know me as Old Scratch." Simon clutched the Book tighter in panic. "Old Scratch? Like... the Devil?" "Oh ho ho," laughed Old Scratch, "that's sure one name for me. But do I look like a real scary devil to you, all fire and horns and pitchforks?" Simon had to nod that Old Scratch definitely didn't look like the devil his mother had told him about. "See, Old Scratch is just a creature of the trees, king of the beasts, and what you got in your hands right there..."
He pointed at the book again, causing Simon to clutch the book so tightly that his fingers turned white and pale. "What you got there belongs to an employee of mine." Simon loosened his grip on the book slightly. "Wait, Death works for you?" "Well," explained Old Scratch, "in a manner of speakin'. See, Death does his whole thing collectin' souls and sending them off, and I take a little bit, and the Good Man takes a little bit, and we all call it even. But lately Death's been taking a little more than usual. Way I see it, I don't think I'm getting fair numbers. Death's getting lazy and just taking folks when convenient, and if someone ain't taken at the right time, they automatically go to the Other Place, and not my place, you know what I'm saying?" Simon didn't really know, but he nodded yes just to end the conversation quicker. "So I'm gonna get that book, I'm gonna use it to teach old Death a lesson, and then I'll start collecting my fair share again. That's the idea, at least." "I'm sorry," Simon said, "but I'm not giving you the book." Old Scratch seemed to huff, and defiantly dug his makeshift foot into the ground. "And why not," he demanded. "Well," Simon explained, "there are very few rules in this life that my momma has for me, but I'm pretty sure one of them is to not make a deal with the devil. Ever. I don't think that one is even a question. If I give you this book, who knows what'll happen to me, or anybody else for that matter. I'm gonna beat Death to Daisy, figure out some way to--"
"Ohh yeah, Daisy," Old Scratch said, another wide, crooked smile spreading across his pumpkin face. "That cute little thing at the farm over yonder. Be a real shame if something happened to her..."
Simon's face flushed with anger. "Don't you say that! I'm going to protect her!" "Woah woah woah, slow down, boy, I didn't say nothing about hurting her. All I said was that it would be a shame if something happened to her. Now who do you think would be better suited to take care of a girl like that... some scrawny boy, or me, the Champion of Darkness, the King of Evil, the Lord of the Forest Beasts? Huh?" Simon shook with anger, his grip on the Book tightening. "It's not gonna be you, Scratch, I can guarantee it." "Oh yeah? Well, boy," Old Scratch said, taking a step towards Simon, an unnatural blue light burning behind his eyes, "how 'xactly do you plan to stop me?" The temperature around them dropped, and suddenly Simon felt very cold. The autumn wind picked up and tossed leaves all around, spiraling them around the two, and for the first time since meeting Death, Simon felt truly afraid. "Things like you don't win, Old Scratch," cried Simon stumbling backwards, his shoelace still untied. "There's bad things in this forest, but there are good things here too!"